Today’s photo was taken inside the President James A. Garfield Memorial in Lakeview Cemetery, Cleveland, Ohio. 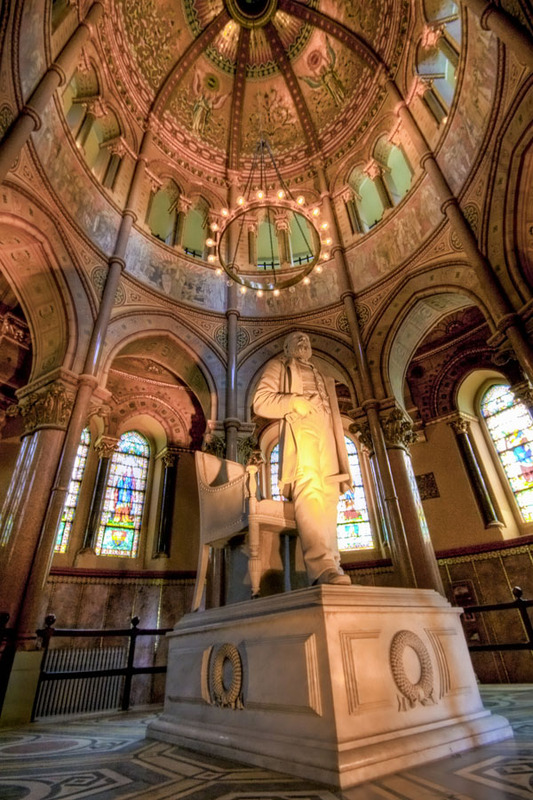 From the Lakeview Cemetery website: “Designed by architect George Keller, the Garfield Monument was dedicated on Memorial Day, 1890. The Garfield Monument stands 180 feet tall and is constructed of Berea Sandstone. Around the exterior of the balcony are five, terra cotta panels by Casper Bubel, with over 110 figures all life size, depicting Garfield’s life and death. The panels include Garfield as a teacher, as Major General in the Civil War, an orator, taking the oath of office and laying in state in the rotunda of the Capital in Washington DC”. This entry was posted on Wednesday, February 15th, 2012 at 8:53 am. You can follow any responses to this entry through the RSS 2.0 feed. You can leave a response, or trackback from your own site.